2018 Goals Review: Are We Going to Meet Our Objectives? Goal setting is one of the most important things that we can do to achieve our objectives. 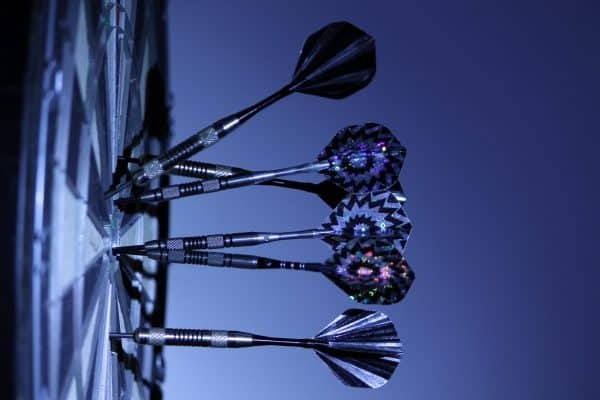 If you don’t have a target it will be difficult to know where you’re aiming. This post is an update to our 2018 goals published back in February 2018. Check out our 2018 goals review below to see how we’re doing so far this year! For several years we only had one goal – to pay off debt. To hold ourselves accountable, we tracked progress on a whiteboard on our refrigerator. Almost every day we had to walk by and look at that whiteboard. When we did lose focus, it was painful to update that whiteboard. Don’t underestimate tools like this to hold yourself accountable. Even though the goals below haven’t been front-and-center this year, they are always in the back of our minds. When we set our goals earlier this year, we weren’t expecting that my wife would take a few years off from her job as a public school teacher. However, after our daughter was born in March my wife decided that she would stay home with her and her older brother for the next three years. Moving to a one income family will impact some of the goals below. However, for our family it will be worth every penny to have her more involved in our children’s lives. This was the big one and we are proud to say that it has been completed. We started the year with a mortgage balance of $31,000 and sent in our last payment on August 3rd. During the past year, more than 50 percent of our take-home pay was going to pay off our mortgage. It’s an amazing feeling to now be completely debt free! We have been in our home for about 10 years now. The house was a fixer-upper and we have since updated almost every room except the kitchen. Now that the mortgage is paid and summer is over, we are getting plans together to make updates to the kitchen. It is very overwhelming trying to figure out what to do! We have a good idea on flooring, appliances, cabinets, and countertops and now it’s all about going out and finding the best deals. Then we’ll need to find a great contractor at a reasonable price. While I’m comfortable doing some of the work, there are certain aspects that I don’t want to mess with. Being able to give back to our community and other important causes that we believe in has been one of the most rewarding aspects of being debt free. Without debt there has been more room in our budget to give more. I won’t go into all the details of who and how much we give, but at the end of the year it will be right around 10 percent of our take-home pay. It’s always a challenge to discuss giving without coming across as preachy. However, we have had such good fortune financially and the least we can do is give some back to improve the lives of others. At some point I hope we are able to give much more than 10 percent of our take-home pay to important causes. As we got closer to paying off our mortgage I increased my 401(k) contributions at work from 6 percent to 13 percent. This isn’t going to allow us to max out our 401(k) this year but we are moving in the right direction. With moving to one income and the expenses associated with a new baby, we stretched this about as far as we could. Hopefully we’ll be able to contribute the maximum amount to our 401(k) in 2019. It would be great if we can also find a way to max our IRAs as well. Does it drive anyone else crazy when someone says a book is a quick read only to find out it’s 200+ pages long? I seem to hear this all the time and it drives me nuts because I am a slow reader. I’ve never been someone who can sit down and read for several hours straight to finish a book in an afternoon. After a chapter or two no matter how interesting the content, I’m either ready to go to sleep or move on and do something else. Now that my excuses are out of the way, below is a list of books that I’ve started this year. I’m trying to do a better job of moving on to a new book if the one I have doesn’t catch my attention. It may still be possible to get to 20 books by the end of the year, but it will be a challenge. In total I have finished 10 books. The odds of finishing 10 more aren’t great but maybe I’ll find a few books that I’m really in to. Expect a future blog post to summarize the books I’ve read this year. The only goal I set for this blog this year was to write 30 posts. Being my first year of blogging, I just wanted to see if I could stay committed. More recently, I’ve committed to posting on a regular schedule, once per week on Mondays. There were a few months where I only posted two times, so I needed to impose a weekly deadline to post more often. This blog post is number 20 for 2018. With 18 Mondays remaining in 2018, I’m hoping to easily hit this goal. I plan on setting more specific blogging goals for 2019 now that I know I’m committed. At the beginning of the year I started a new job within my current organization. While I believe that the year is going well, you never really know until the final performance review happens. For me, that will take place in November. There is still a lot of time for me to mess up, but so far this year has gone well. This fall I am planning to help lead a Financial Peace University (FPU) class at my church. We mostly followed the Dave Ramsey plan to get out of debt and am excited to help others do the same. To learn more about FPU and our experience going through the class as an attendee, check out my review of FPU. This is the goal I know nobody cares about, yet it’s important to me. For the last 15 years I’ve played on a competitive men’s baseball team. It’s somewhere between a semi-pro and beer league team. Most everyone in the league plays or played in college, so it’s quality baseball. I now manage the team which has surprisingly been a great personal development opportunity. Long story short, we ended up coming in second place in the league. We did make it to the championship series (best of 3 series) and lost both games in extra innings. It was an exciting season and we had a lot of fun. We have an amazing group of guys on the team. Everyone gets along, plays hard, and there is no drama. I love the game of baseball and am lucky to still be around the game. The best part is how much my 4-year-old loves it as well. This was by far our biggest stretch goal for this year. After paying off the mortgage it is going to take some time to build up enough savings to purchase a rental property. Given that we have increased charitable donations, 401(k) contributions, moved to a single income, and still plan to fix up our personal residence, it’s going to take us a while to be in position to purchase a rental property. 2018 has been a great year so far. Paying off the mortgage is obviously a huge accomplishment and we plan to spend some time later this year celebrating. Next year we plan to start saving aggressively again with the goal of purchasing rental property. I am excited for what the rest of the year and the years ahead hold for our family! Congrats on making so much progress! If you’re still looking for a book recommendation, I highly recommend “The One Thing” by Gary Keller. It helps prune out extraneous activities and goals. Thanks for the recommendation! I read “The One Thing” a few years ago, but it’s probably time to read again. I got a lot out of the book!